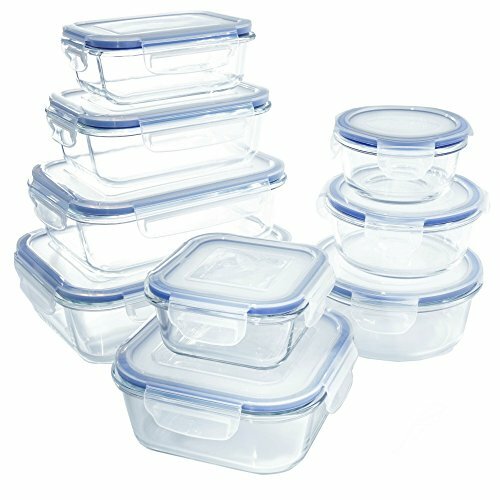 Glass Container Set for food storage with snap lock tight lids. 18 PIECE SET - This glass food container set includes 9 glass containers of varying sizes and 9 matching lids. This is the perfect solution to store all of your prepared meals, snacks, and leftovers. 100% BPA FREE AND FDA APPROVED - 1790 Glass Storage Containers are 100% FDA Approved and BPA Free, and made out of borosilicate glass for easy heating and durability. They're a great size for meal prepping and leftovers for the whole family! OVEN, MICROWAVE, FRIDGE, FREEZER SAFE - heat resistant up to 450 ºF. They're stain and odor resistant too - so you'll enjoy them for years to come because they simply will not discolor, warp, melt or chip like the old ugly plastic yellowing containers. NESTING DESIGN - Gone are the days that you have to worry about stacking precarious piles of plastic in your kitchen cupboards. This set was designed with nesting, so the smaller containers fit inside the larger containers for ease of storage. Every piece of this set is dishwasher safe, too - so you never have to worry about hand washing each piece. MONEY BACK GUARANTEE - If for any reason, you aren't happy with your Glass Storage Containers, just send them back to us for a prompt and full refund. We want to help you make life easy and keep you and your family fed by storing and preserving the meals and leftovers you prepare so they can be ready at a moment's notice. So click the Add to Cart button now, knowing your purchase is protected by our Money Back Guarantee. If you have any questions about this product by 1790, contact us by completing and submitting the form below. If you are looking for a specif part number, please include it with your message.